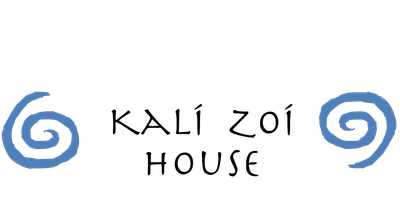 Kali Zoi is Greek for “good life.” That's what you'll have when you book a stay in this large, classic conch style house in historical Old Town. This 1,960 square foot, 2 story house has all of the charm of a 19th century home but was actually built in 1988 so it has all of the modern amenities that guests need to enjoy the ultimate island vacation. With 3 bedrooms and 3 full bathrooms, open living spaces with vaulted ceilings and large upper and lower porches, there is plenty of space for families and friends to relax. Guests enter the property through a classic white picket fence gate. The shady front yard is filled with tropical trees and plants and beautiful orchids. The Southern style front porch is a perfect place to sit and enjoy morning coffee or an evening cocktail while watching passersby. One enters the front door into the expansive welcoming room in the front of the house. It is great for reading, games, conversation and entertaining. The home’s three bedrooms are all located downstairs off the main hall. The hall Is lined with large windows, French doors to the side yard and artwork. The first bedroom has a funky bohemian vibe. It has twin beds and connects to the hall bathroom with toilet, tub and shower. The second bedroom has tranquil yellow and grey décor and features a queen bed. This room shares the hall bath or also could use the upstairs full bath with toilet, tub and shower. The master bedroom at the back of the house is a soothing room with a queen size bed and an en suite bathroom with large tiled modern shower. There is a private entrance from the room to the back patio and pool. All bathrooms have tiled walls in the showers, tiled floors and granite counters and are stocked with hairdryer, shampoo, soap and toilet paper. All bedrooms have closets with shelves, dressers, mirrors and bedside tables. All sheets, blankets and towels are provided for our guests. A laundry closet is also located off the downstairs hall with a full size washer and dryer for your use. Laundry soap is provided. As you move to the upper level, you emerge into a comfortable, airy and bright window filled family room with sectional and seating to enjoy the large satellite/cable tv with stereo sound. There is also blue tooth stereo system, blue ray player, internet service and secure wifi. The farmhouse dining table has seating for 8 people and there are plenty of dishes, utensils and serve ware to host a large dinner. The spacious, modern kitchen features striped mahogany cabinets, stainless steel appliances, a large center island, granite countertops, and a coffee and wine bar. Every utensil a gourmet cook needs to prepare a fabulous meal, the pots and pans and all dishes, utensils and glassware are stocked for your use. Plastic ware is also provided to enjoy outdoor dining on the porch or by the pool. French doors open from this upper great room onto a beautiful wrap around covered porch that gives you a wonderful tree house view of the island’s tropical flora and fauna. This porch includes a nook with a table and two chairs to enjoy the morning paper. Ceiling fans and large, plentiful windows take advantage of the tropical breezes and sunshine. Central air conditioning and mini split system keep the house cool and comfortable. A glass door at the end of the lower main hall leads to the secluded fenced back patio. Here, you can relax under the umbrella in the lounge area, next to the in ground plunge pool. The pool can be heated and has automatically timed fountains. The soothing sounds of the water make it the perfect place to unwind after a day of island touring. The pool is cleaned and serviced weekly. The house has been newly decorated from top to bottom. It is filled with original art and crafts by local Keys artists that lend to the tropical island atmosphere. yoga and fitness facilities, veterinarians, bike rentals, churches, and shops. Several excellent restaurants are just minutes away by foot or bike including El Siboney, Mo’s, The Flaming Buoy and the newly relocated Seven Fishes. Louie’s Backyard and Blue Heaven are less than one mile away. The famous Duval Street and all of its fun and activity is also less than a one mile walk. In the other direction, you can walk, bike or drive to White St Pier, Higgs Beach, Key West Wildlife Center, tennis courts, bocce courts, a children's playground or a wonderful dog park wth areas for both large and small dogs. All of these features are yours at Kali Zoi, to make your vacation stay the good life. ATTN: This property will NOT be listed on Craig's List at any time. If you see this home represented on Craig's List, please be aware that it is a scam.